Our wide assortment of downlights gives you the flexibility for achieving perfect ambient lighting, spotlighting or a soft glow as the mood fits you. We have models in a variety of sizes, with or without LEDs. 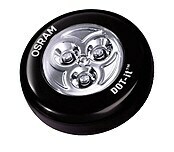 Our range also includes slim LED light discs which are easily concealed under shelves or in display cabinets. Give your entire room a lift by installing flush fitting downlights into your ceiling. Add a dimmer and you can have room lighting that suits whatever mood strikes you at the moment. Our initiative to offer you a wide range of LED lighting products is just one of our ways of contributing to a sustainable lifestyle. Follow us on our journey towards sustainability.clasohlson.co.uk. Small and compact 12V spotlight. For flush mounting. Energy-efficient. 2-core heat-resistant cable suitable for installation of downlights.